When you buy this product you earn 50 Reward points. Supplement with a sun cream in the day time. This Moisturizer is a real beautifier. Thanks to a unique combination of protecting, soothing, strengthening and moisture binding substances in high concentrations, the skin will return to optimal functioning and glow. It has been established that Vitamin C strengthens the skin and limits sun damage. This antioxidant also helps reduce acne, pigmentation spots and rosacea. Vitamin E increases the effectiveness of Vitamin C and vice versa. Niacinamide soothes the skin and furthermore restores the barrier function. Hyaluronic Acid and Glycerine help by filling out the fine lines on dry skin and making them less visible. 1. How much Moisturizer should I use? Dry skin requires more Moisturizer than oily skin. In both cases it is important that you apply a thin layer over your whole face. If you wish you can always apply more cream more frequently. 2. Can I also apply the Moisturizer around my eyes? The Moisturizer contains extremely mild ingredients which are also suitable for the more sensitive skin around the eyes. A separate eye cream is not necessary. The Moisturizer contains high concentrations of active ingredients such as antioxidants. These can make your skin tingle after application. This is not serious. It is, however, important that you gradually increase the cream by, for example, applying it once a day to begin with instead of twice a day. 4. Can the Moisturizer reduce my wrinkles? No cream can smooth existing wrinkles away. The Moisturizer can ensure the skin barrier function remains healthy and strong, reduce dryness lines, redness, acne and pigmentation spots and make dull skin smooth and radiant again. 5. Is the Moisturizer also suitable for young or, likewise, mature skin? It is important to look at the needs of the skin instead of just the age. If your skin is drier, choose the Moisturizer for normal to dry skin. 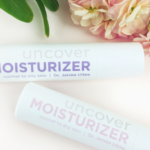 This Moisturizer contains more hydrating ingredients. If your skin is oilier and perhaps unsettled, choose the Moisturizer for normal to oily skin. This contains more soothing and sebum regulating ingredients. 6. Why is there no separate day and/or night cream? The Moisturizer can be applied both in the morning and at night. It is actually a day and night cream in one. Don’t forget to apply a sun cream over your Moisturizer in the morning. Why Do You Introduce Our Moisturizer Gradually?